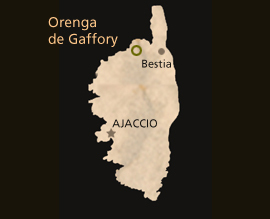 Created in the sixities on clay and limestone soils, our vineyard of 60 hectares consists of many fragmented parcels lodged between the towns of Saint-Florent, Patrimonio Oletta Barbaggio and Poggio d’Oletta, all eligible for the AOC of Patrimonio. This distribution helps us benefit from various micro terroirs that allow usto produce wine of complexity, structure, balance and flavors. Our different plots are planted with traditional Corsican grape varieties: Vermentino for the AOC Patrimonio Blanc, Niellucio for the AOC Patrimonio Red and Rosé, Muscat à petits grains for the AOC Muscat du Cap Corse. Our cellars are equipped with the most modern winemaking equipment (pneumatic presses, temperature controlled stainless steel tanks); air conditioning allows us to maximize the potential of grapes and to package and preserve our wines in the best conditions. We experiment with different techniques of winemaking and harvesting times to offer you three distinct wines: Cuvée Gaffory is characterized by freshness and fruit, Cuvée Felice is an expression of our different varieties, and Cuvée des Gouverneurs is the quintessence of our reserve wines vinified and aged in oak barrels. Our philosophy has always been to respect nature, the land that gives us so much. This spirit materializes in constant tillage of the soil, requiring a major investment in manpower to offset the lack of use of pesticides and toxic chemicals. The microclimate we enjoy here in Patrimonio, helps us in our approach. Always ventilated by the sea breezes, the vine, even during summer periods of great heat or after the rains never stays or wet or moist. This avoids disease to develop. So we can, through a repeated work, practice a reasoned culture for years and work towards biological evolution of the culture of our vineyards. Both fruity and floral, citrus and white flowers of the orchard, as well as its slight mineral side make it a complex wine, round, lively and long in the mouth. Slightly evolved (18 to 24 months); notes of honey and wax will be revealed as it matures. This wine will be your accomplice as an aperitif and will delight you throughout the meal (crustaceans, fish, cheese). Beyond its pale pink hue, you will discover its red fruit (currant, raspberry) and light floral side. On the palate, its roundness, freshness and balanced acidity make it a velvety wine. The wine is meant to be enjoyed now! AOC: Patrimonio Blend: 80% Niellucciu, 20% Grenache Harvest: Manual and mechanical. Direct pressing of whole bunches, followed by bleeding. Settling at low temperature. Fermentation temperatures: between 18 and 20 ° C. Elevage: In stainless steel. The traditional wine of the area will delight you with its red tint sustained by its breadth and richness on the palate. 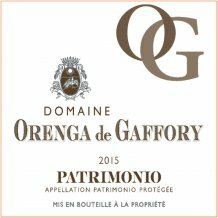 This wine has no intention of hiding its origins – clay and limestone soil of Patrimonio. AOC: Patrimonio Blend: 90% Niellucciu, 10% Grenache Harvest: Manual and mechanical. De-stemming and crushing. Fermentation for 15 to 20 days. Fermentation temperatures between 27 and 30 ° C. Regular pumping. Elevage: In stainless steel tanks after malolactic fermentation.